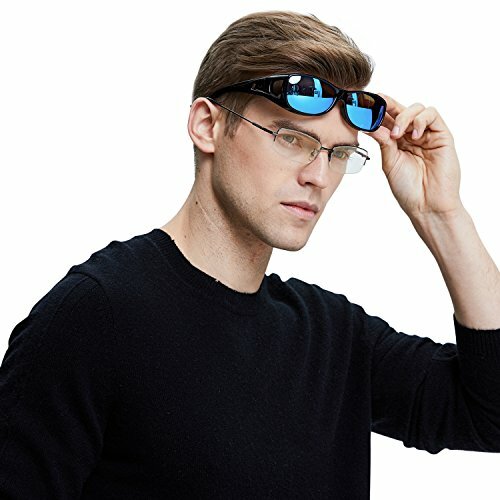 Duco focus on a wide variety of functional glasses from night vision glasses,prescription glasses, sports cycling glasses,anti blue ray radiation computer glasses to UV400 protection polarized sunglasses. We endeavor to provide quality products at prices which provide value to our customers. Duco fit-over sunglasses are designed to wrap around your face blocking the sun from the side as well as perfect for anyone who wants the benefits of sun protection while wearing their prescription glasses. They're lightweight and easy to slip on over your prescription glasses. They also provide premium protection against the sun's harmful rays. It is 100% UV protection. Highly useful for sports, driving, and fishing by helping the participant in these activities to see more clearly. 1- Measure the widest part of your prescription frames left to right, this is the "width". Next measure the height of the lens with frame included. 2- Choose the DUCO frame (below) that is slightly larger in width and height than your frame measurements. If your frame width is less than 5-3/8inches,height is less than 1-5/8inches, please buy common size. If your frame width is longer than 5-3/8inch, shorter than 5-1/2inches;height is less than 1-5/8inches, please buy plus size. If your frame width is longer than 5-1/2inches,OR height is larger than 1-5/8inches,please DON'T buy it. Glasses X1, glasses case X1, glasses cloth X1,glasses bag X1. Visit www.amazon.com/shops/ducoglasses for more information on DUCO glasses and extensive line of products. DUCO fit over men, women, and children's prescription glasses! Polarized sunglasses can be worn over existing prescription glasses with Fashion appeal and designer features. Side Lens for better peripheral vision and eye protection. Please take a minute to check detail page. PRODUCTS DIMENSION-Lens height:40 mm (1.57 inches); lens width:60mm (2.36 inches); leg length:140mm(5.51 inches); nose bridge:20 mm ( 0.78 inches); frame length:145 mm (5.7 inches). The frame is made of TR90,it is extreme flexibility, durability and light weight make it the perfect material for performance eyewear.It can be bent to 90 degrees without broken and can float over water. (See image left) So it is much worth your money than other's Polycarbonate Frame which may be half of DUCO's price. DUCO Polarized lenses are made using an injection process that ensures they are optically correct, decreasing eye fatigue and increasing comfort. DUCO Shatterproof TAC POLARIZED lens have a filter that works to prevent the glare from reflecting on flat surfaces (water, snow, road pavement) which interfere with vision to protect your eye for the UV damage.So it is 100% UVA and UVB Protection. 30 Day Money Back Guarantee.Lifetime Breakage Warranty. It must worth your money,return and refund is applicable for any reason.Just have a try. If you have any questions about this product by DUCO, contact us by completing and submitting the form below. If you are looking for a specif part number, please include it with your message.